Modular Flotation System: TriFloat® is here! In a TriFloat® system, six flotation stages are arranged in a circle for a neat and tidy arrangement. One distinct advantage of this arrangement is that at a small scale, all six mechanisms are driven from a single central drive motor, resulting in significant space and cost savings. Another advantage is that the six sectors can be separated flow-wise and allocated to roughing, scavenging and cleaning all in one compact arrangement. APT's process engineer, Hannah Peacocke, continues "for example, the first three sectors could be roughers, the second two scavengers and the final one a cleaner. This makes the system truly modular and highly attractive to smaller operators who need flexabililty". Alternatively, a complete TriFloat® module of six sectors could be allocated to each duty as seen in the schematic below. Products are easily moved around the circuit by pumps arranged radially, making for a very user friendly set up. Stage tailings simply flow through the wall to the next sector, making for a logical arrangement. With a high lip length to volume ratio, and the advantageous placement of the mixing mechanism, froth is removed easily and efficiently. APT has developed a bench scale system for testing as well as for making comparisons against conventional laboratory tests. 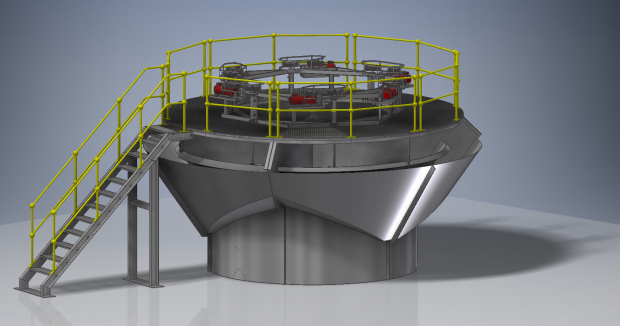 A larger batch pilot unit has also been developed and tested for batch pilot testing. Initial results show APT TriFloat® to be superior to conventional square section lab flotation cells and particularly suitable for high yield materials like graphite and high sulphide materials. APT are able to test client's material through associate mineral testwork laboratory Peacocke & Simpson. Batch laboratory tests as well as locked cycle can be performed and as a subsequent phase 60kg batch pilot tests can also be conducted. Please contact us for more information on APT's modular flotation system and let us know your specific needs, as always we are happy to help and get you going on your mining journey today!